Have you tried searching your locator for a country or state (e.g. "Canada" or "Texas") but didn't see the results you expected? This page explains the typical cause and how to fix it. The locator's search system is based on proximity to a search point rather than geographical boundaries. For more explanation, you can see our help page on the Search Radius option. Any stores that are closer to the starting point than the search radius will be shown. If there are more stores within the search radius than the maximum results setting will permit, the stores closes to the starting point are shown. In the example above, only a couple of stores are within the search radius. The best option is often to increase your Search Radius on the Search Settings page of the dashboard. 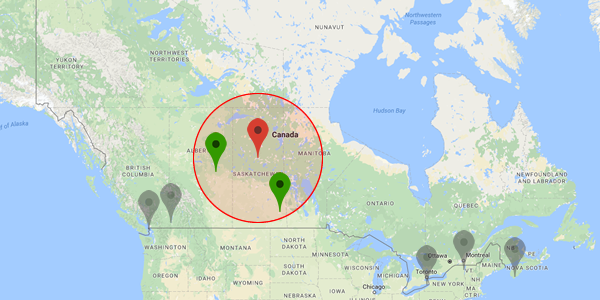 A larger Search Radius will cover more of the country in the search area and is more likely to return results. This fix is especially encouraged if you have worldwide distribution but only have a few stores/distributors per country. If you have many stores, you may also want to encourage your visitors to search for a city or postcode to ensure the closest relevant results are shown. You could consider adjusting the search placeholder text or adding a separate note to your store locator page. As an aside, our analytics tell us that the majority of visitors already do search by city or postcode. Finally, if you have a smaller store list, you may also want to consider displaying all of your stores as soon as the locator loads. This will instantly give an overview of where you have stores, and visitors can zoom the map into their region to identify the closest stores. Of course, visitors can still type a search query to find stores in a specific area. To change this setting, open the Search Settings page and change Initial contents to Show all stores.